The Arkansas HIV Reform Initiative convened in May to continue to solidify its vision for advocacy and grow its membership. Advocates are currently focused on analyzing modernization efforts in other states in order to formulate their own strategic plan for reform. Individual coalition members also continue to present on HIV criminalization in Arkansas in order to expand the Initiative’s membership and identify new stakeholders. Meetings are held on the second Thursday of the month at 11:00 AM (CT). If you would like more information on HIV criminalization in Arkansas or are interested in becoming an advocate with the Arkansas HIV Reform Initiative, please contact Arpita Appannagari at aappannagari@hivlawandpolicy.org. Californians for HIV Criminalization Reform have been highlighting an analysis of California’s modernized law recently published in the New England Journal of Medicine. “Rethinking Criminalization of HIV Exposure — Lessons from California’s New Legislation” appeared in the March issue of the journal and provides critical perspective on the improvement of California’s law as well as the importance of the HIV criminal law reform movement. The Florida HIV Justice Coalition established four working groups: Community Engagement and Education, Rapid Response, Lobbying, and Defense Action. The coalition convened in April and May, with most working groups holding their initial calls in March and April. The coalition will hold an in-person strategic planning meeting in Ft. Lauderdale in June to focus on education and outreach activities leading into the next legislative session, and to solidify coalition structure and decision-making processes. Meetings are held on the third Thursday of the month at 1:00 PM (ET). If you or your organization is interested in supporting HIV criminal reform efforts in Florida, please contact Kamaria Laffrey (kamaria.laffrey@seroproject.com). The Fairness Campaign worked closely with CHLP and ACLU of Kentucky to improve HB 193, a communicable disease exposure bill relating to interactions with peace officers. As introduced, this bill would have imposed felony charges for behavior that poses little to no risk of disease transmission, including in response to casually transmitted and curable conditions. HB 193 is an improvement in Kentucky, where people living with HIV have been charged with felony wanton endangerment for acts like spitting or biting, which pose no or negligible risk of HIV transmission. Felony wanton endangerment carries a penalty of up to five years in prison and/or a fine of up to $10,000. (See an explanation of Kentucky’s current law in CHLP’s Sourcebook.) By contrast, HB 193 imposes misdemeanor penalties, which are punishable by a maximum of 12 months in jail. HB 193 passed through the Kentucky House of Representatives in March and the Kentucky Senate in April. Kentucky’s governor signed HB 193 into law on April 26, 2018. The Louisiana Coalition on Criminalization and Health (LCCH) convened in April and May to continue work on their strategy in response to HB 112 and HB 275. HB 112 is a bill addressing when someone may be forced to undergo mandatory testing for HIV and other infectious diseases on the basis of a law enforcement officer alleging exposure to that person’s bodily fluids during a lawful arrest. The bill expands the definition of “law enforcement officer” to include forensic lab personnel and authorizes mandatory testing due to “any method of intentional or non-intentional exposure to blood or other bodily substances.” The bill contains both original and amended language that does not reflect current scientific knowledge regarding disease transmission risk. HB 275, introduced by Representative Edmond Jordan (D-29) on February 28, proposes changes to Louisiana’s criminal statute “Intentional exposure to AIDS virus.” (LA. REV. STAT. ANN. § 14:43.5). Although the bill was intended as an effort to modernize Louisiana’s law, the bill sponsor did not engage in robust consultation with LCCH prior to drafting, despite the coalition’s efforts at outreach and education. The current version of HB 275 includes retention of “HIV exceptionalism,” a misguided focus on disclosure as tool for reducing HIV transmission, the criminalization of activities that pose no risk of HIV transmission, and severely disproportionate felony punishment. While the original bill as introduced included the requirement for “specific intent to transmit,” this was eliminated by the House Administration of Criminal Justice Committee. The addition of affirmative defenses (e.g., that a person took practical means to prevent transmission as advised by a health professional) are conditioned on a PLHIV first having disclosed their status. LCCH members were active in opposing both of these bills. Coalition members traveled to Baton Rouge and provided testimony in opposition to HB 275 on two separate occasions, and created an HIV Policy Action Center, which encouraged people to call their legislators and provide education to vote no on HB 112. HB 275 passed unanimously through the House and Senate and has been sent to the governor for signature. HB 112 was signed into law by the governor on May 11. Meetings are held on the second Wednesday of the month at 11:00 AM (CT). If you are interested in information about HIV criminalization in Louisiana or joining the LCCH, please contact Chip Eakins at ceakins@philadelphiacenter.org. 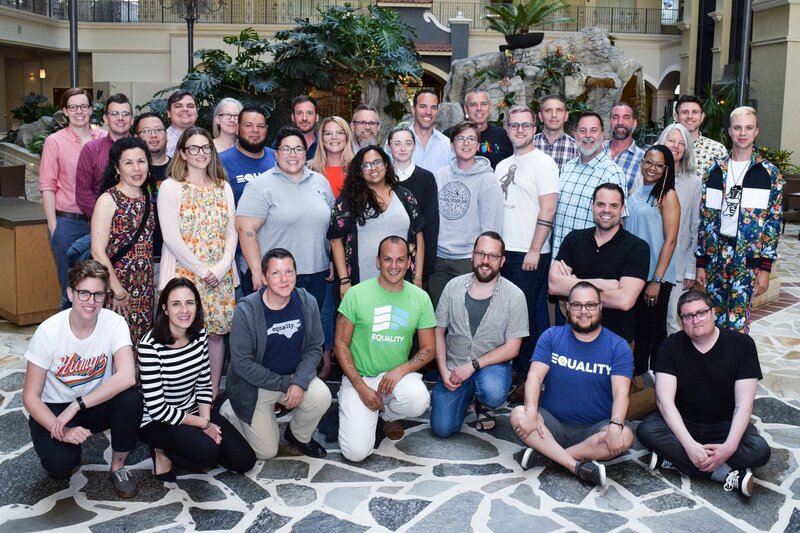 The Missouri HIV Justice Coalition convened in April and May to discuss legislative strategy and education through their continued work on HB 2674 and HB 2675. Both bills were filed in March and referred to the House Health and Mental Health Policy Committee for a hearing on May 9. Coalition members provided testimony at the committee hearing. Follow this link for more information on the committee hearing and Missouri HIV Justice Coalition members’ testimonies. Meetings are held on the second Friday of the month at 1:00 PM (CT). If you are interested in becoming an advocate with the Missouri HIV Justice Coalition, please contact Ashley Quinn at ashley@empowermissouri.org, or visit the coalition’s website for additional information. The Ohio Health Modernization Movement convened in April to continue ongoing conversations about structure and decision-making processes, including Equality Ohio’s new role as the group’s administrator. OHMM has formed an Interim Steering Committee of Ohioans—people living with HIV, community advocates, and service providers—which will convene for the first time in May. Meetings are held on the third Monday of the month at 5:00 PM (CT). If you would like information on HIV criminalization in Ohio or are interested in becoming an advocate with the Ohio Health Modernization Movement, please contact Kim Welter at kim@equalityohio.org.